The Kelsey is up and running! This sweet little press was found at an auction – bought by a friend for a song – and given to me. What an awesome gift. 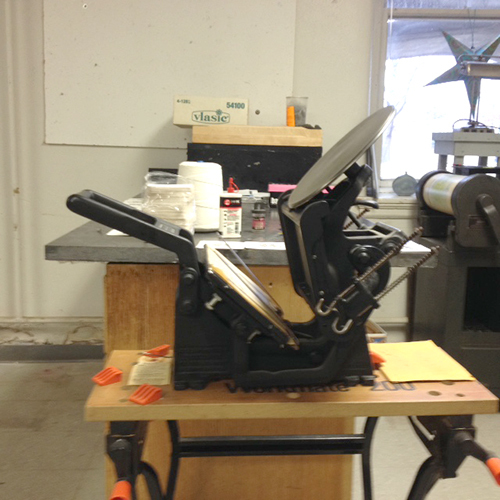 So, she (my presses seem to have names and genders) is up and running and we are ready to start of my Printmaking class with letterpress. It is a small portable press unlike the big presses at Printers’ Hall. Hopefully in April, it will be warm enough to print on some seriously wonderful letter presses. Keep your fingers crossed and out of the gears. BTW – I ordered 1000 coasters so there may be a printing format theme happening here.